It took almost twenty years, but the first feature film chronicling one of the worst disasters in the history of mountain climbing opens on September 25. 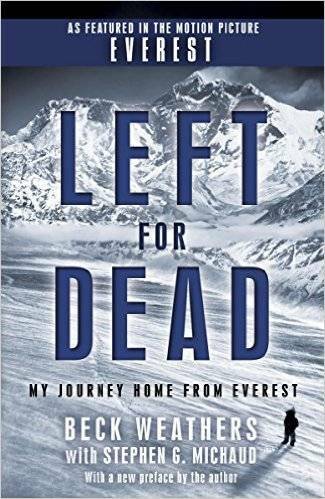 The May 11, 1996 tragedy on Mount Everest claimed eight lives and spawned a host of conflicting accounts. Journalist Jon Krakauer’s Into Thin Air (1997) is probably the best known, but there are a several other book-length narratives, including Anatoli Boukreev and G. Weston DeWalt’s The Climb (1999), Beck Weathers’ and Stephen G. Michaud’s Left For Dead (2001), Leni Gammelgard and Press Seal’s Climbing High (1999), and Louis Kasischke’s After the Wind (2014). Around 1996 mountaineering went commercial, partly thanks to advances in technology that allowed less experienced climbers to attempt the highest peaks. Commercialization led to crowding, with an unprecedented seventeen expeditions in 1996. Did the hubris of inexperienced tourist-climbers combined with the greed of mountain guiding companies contribute to the fatalities? To what extent was the government of Nepal partly responsible for the crowded and dangerous situation (permits at the time were $70,000)? Is it ethical to pay the Sherpa people to take serious risks for the benefit of affluent Westerners? Add to all of this a severe storm that stranded climbers at the summit and some questionable decisions in the face of a crisis and you’ve got a gripping story with lots of conflict and human drama. The script is apparently based on several written sources, including Krakauer’s book, as well as new interviews with the survivors. Weathers’ digital edition now has a movie tie-in cover that proclaims its connection to the film. The director, Iceland’s Baltasar Kormákur, is probably best known in the US for two drug-heist action movies, Contraband (2102) and 2 Guns (2013), both starring Mark Wahlberg. I haven’t seen those, but I thought he did a great job adapting Arnaldur Indriðason’s excellent thriller Jar City. And he’s already made a critically acclaimed survival film based on real events, The Deep. The screenwriters, William Nicholson and Simon Beaufoy, have some serious film cred, including Mandela, Les Misérables, Gladiator, The Hunger Games: Catching Fire and Slumdog Millionaire. Beaufoy also co-wrote the screenplay for 127 Hours, the underrated movie starring James Franco as a climber trapped under a boulder. The cinematographer, Salvatore Totino, hasn’t worked on a film where nature is a major antagonist, but the IMAX-branded Everest trailer is fantastic (the film opens in IMAX theaters a week ahead of wide release). Certainly it will look way better than the 1997 TV movie Into Thin Air. As far as the actors go, the stars include Jake Gyllenhaal (Scott Fischer), Josh Brolin (Beck Weathers), Jason Clarke (Rob Hall), Michael Kelly (Jon Krakauer), Naoko Mori (Yasuko Namba), John Hawkes (Doug Hansen), Martin Henderson (Andy Harris), Vanessa Kirby (Sandy Hill Pittman), Sam Worthington (Guy Cotter). Keira Knightley and Robin Wright play the partners of Hall and Weathers. The casting, especially Brolin, is great, with one exception: Jake Gyllenhaal. He’s just too bland to convey the larger than life magnetic personality of Fischer. I confess I don’t think much of his acting abilities, as his excruciatingly mannered performance in Nightcrawler recently reminded me. That said, he’s ok when he’s surrounded by a strong cast, like with Heath Ledger in Brokeback Mountain, so maybe he’ll be great in Everest. My apologies to Gyllenhaal fans. 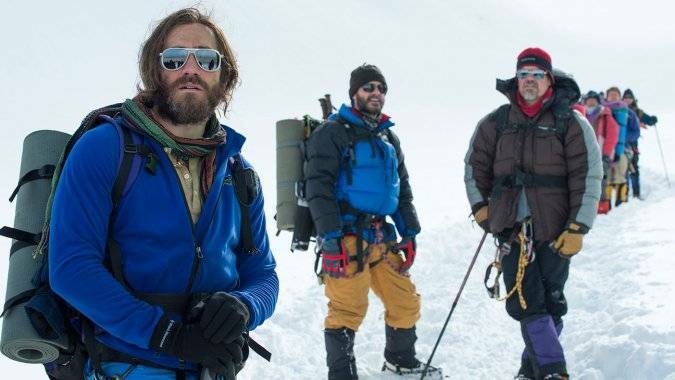 This probably goes without saying (sadly), but Everest focuses on the Westerner-led expeditions, and on the Westerners in them (with the exception of one Japanese climber). Three of the eight people who died that day on the mountain were from the Indo-Tibetan Border Police expedition. (One of them, Tsewang Paljor, is thought to be Green Boots, one of the more famous frozen corpses on the mountain.). Then there are the many Sherpa guides without whom none of the climbers would have had a prayer of making it to the summit or back. Four are listed in the cast, but only two are named characters. I’m really interested in how certain decisions are portrayed, such as one group leaving two climbers for dead, and a guide descending the mountain ahead of his clients. 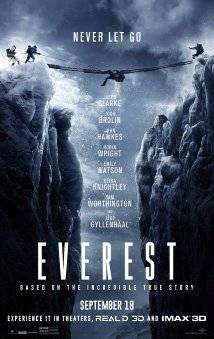 And how will Everest itself be portrayed? Will viewers see that the mountain was littered with discarded oxygen cylinders, human feces, trash, and corpses too cold to decompose? Mountains remind us that the world is not human-made or human-controlled. Even from the comfortable distance of reading or sitting in a theater, mountaineering tales call us to humility and wonder. Everest is doubtless going to be a visual feast, especially in IMAX, and I’m hopeful it will do justice to the human elements of the story. If it’s half as gripping as Krakauer’s, Boukreev’s or Weathers’ books, I can’t wait to see it.